under the age of 18 before they can take their DMV driving test and get their California Drivers License. These services can only be performed by a Driving School Instructor licensed by the DMV. Also required is 50 hours of driving with a parent or guardian prior to taking the drive test,10 hours of that at night. Teenagers between the ages of 15 ½ and 17 ½ are required to take their first driving lesson with a Licensed Driving Instructor before they can drive with their parents. The Licensed Driving Instructor will sign (validate) the instruction permit on the first lesson. The permit must be 6 months old before the teenager can take the DMV driving test. A permit is valid for one year. Teenagers between the ages of 17 ½ and 18 may immediately drive with their parents upon receiving their instruction permit. Behind-the Wheel instruction is available for teenagers, adults and seniors through Elite Driver Training Services in the Fresno/ Clovis and surrounding areas. Call 559.435.3865 or toll free 1.888.888.9891. Our driving lessons cover all of the necessary driving issues drivers face everyday. 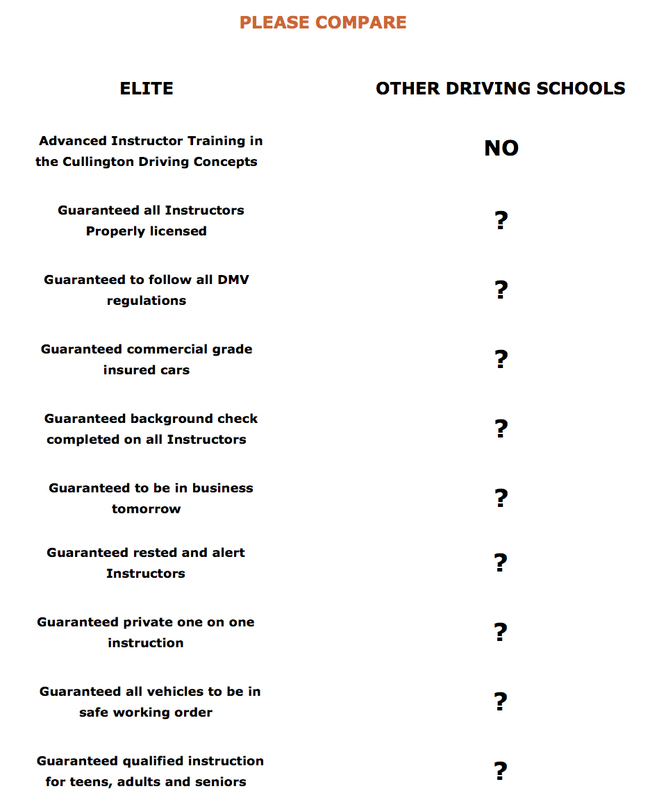 Elite driving lessons include actual driving (what a concept). The first lesson is not spent in a church parking lot. We get our students moving on surface streets quickly. 2. We cover right turns at green and red lights, traffic flow and proper spacing. 3. We go on a mountain drive, freeways and downtown. 4. We deal with U turns, parking and reversing. 5. Three point turns and parallel parking are addressed. We believe that the valuable time we have with our students is short so we get busy driving and sharing our knowledge. Most driving schools cover much less. Choosing your behind-the-wheel instructor will make all the difference; potentially life saving. There is NO COMPARISON GUARANTEED! Elite Driver Training Services the True Professional Experts. Video streamlined for DSL or Broadband. Now serving the Fresno, Clovis and surrounding areas.